Canyonlands National Park is the less famous and much bigger national park near Moab, Utah. The park features large open expanses of mesas, river canyons, rock formations and an arch. While not as famous as Delicate Arch, Mesa Arch is a favorite of photographers and tourists. The walk to Mesa Arch is short and easy unlike the long and strenuous hike to Delicate Arch. 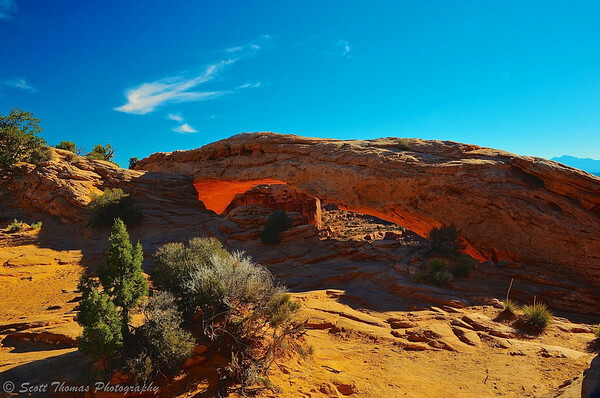 It is known for how the Sun lights up the underside of the rock forming the arch at sunrise. My wife and I visited Mesa Arch a couple of hours after sunrise back in late September. We had heard there had been some 50 photographers at the arch earlier in the morning. Mesa Arch in Canyonlands National Park near Moab, Utah. Nikon D700/28-300VR, f/16, ISO 200, EV 0, 28mm focal length, HDR Image. You can still see sunlight being reflected onto Mesa Arch’s bottom in the High Dynamic Range (HDR) image above. Note, there are no other people either. We had the arch to ourselves for 20 minutes before a few other tourists joined us. It is a calming feeling being there. Our National Parks not only preserve beautiful places but also places for us to renew our minds and spirits. Canyonlands main claim to fame after the Mesa Arch are the many overlooks you can stop at as you travel along the Island in the Sky District road. This road is paved and gives easy access to the outlooks with parking areas, picnic sites and toilets (Notice I did not say restrooms). One such overlook is Buck Canyon. Once we parked our car, it was a short walk to the edge of the Island in the Sky District. 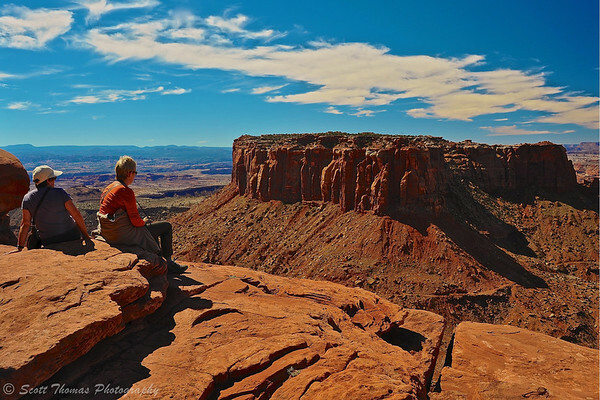 A man gazes out from Buck Canyon Overlook in Canyonlands National Park near Moab, Utah. Nikon D700/28-300VR, 1/80s, f/16, ISO 250, EV -0.3, 44mm focal length. Driving here you do not realize how high up you are until you get to one of the overlooks. Along the route there are five short hikes which can all be done in a day if you start early enough. For us, we settled on the Grand View Point Trail. This trail goes along the southern point of the Island in the Sky District right along the edge and up and down through rocky terrain. At the end, you get a beautiful view covering hundreds of square miles of picturesque landscapes in all directions. Tourists look out over Canyonlands National Park from Grand View Point near Moab, Utah. Nikon D700/28-300VR, 1/80s, f/16, ISO 280, EV 0, 28mm focal length. In this age of information blasting at us from all directions via smart phones, computers and media outlets, it was so very pleasant to sit and look out over the expanse of wilderness and soak it all in. For me, areas like this represent time…geologic time, which is so much different than Man’s concept of time. Here, time is measured in eons and not seconds. We see only a very tiny part of it during our lifetimes. These rock formations show us millions of years of time in their faces and tell us a story of vast oceans, long dry and windy spells followed by rain and floods. Such natural forces over time created the awesomely beautiful area found in Canyonlands National Park. 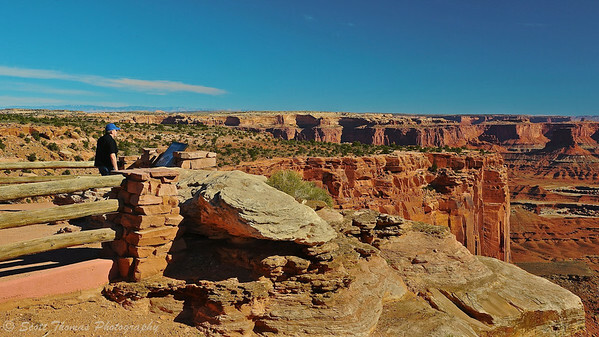 This entry was posted in Nature and tagged 28-300mm, blue, buck canyon, canyonlands, canyons, cliffs, clouds, grand view point, island in the sky district, landscape, mesa arch, mesas, moab, national park, nikon D700, overlook, sky, tourists, trail, utah, vr. Bookmark the permalink. Beautiful, Scott. The first image in particular is stunning. Thanks, Robin. The western landscape was stunning.